Approaching rainy season, it has been noted that around 5,327 trees that spread in eight sub-districts, Central Jakarta have been pruned.
" Every day not less than 12 trees are pruned. Most of them are prone to fall and broken"
"Every day not less than 12 trees are pruned. Most of them are prone to fall and broken," expressed Sabdo Kurnianto, Head of Central Jakarta Forestry Sub-dept., Tuesday (10/2). Types of tree pruned are varied, starting from angsana, tanjung, ranji, mahogany, and sengon. 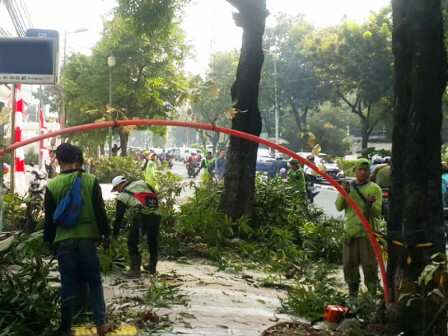 In the meantime, Tanah Abang Sub-district Head, Dedi Arif Darsono admitted that locals sent complaint about the condition of trees that are prone to fall. "That's we want tree pruning to be intensifi e d," he stated.